The Easy Hollower No. 1 is a straight shank tool designed for boring out the bulk of wood from the center of the vessel before undercutting the sides and rim. Tool measures: 1/2" x 8-1/2"
Comments On Jul 04, 2016:I make a lot of hollow ornaments and birdhouses, and this is a perfect tool for easy and fast hollowing with excellent control. Cuts fast, and is nice and stable. You can also use this tool for more than just hollowing. The small diameter of the cutter makes it perfect for small coves and detail work. I turn to this tool for a lot of tasks besides just hollowing. And of course - no sharpening!! Comments On Sep 11, 2015:Just started doing hollow forms over the last couple months. Borrowed these tools from a club member and really enjoyed them. Was hollowing a 6 inch open form bowl through a two inch opening. Left a great finish. Bought my own and have since done three other bowls and vases. Great tools. Took a little to get the feel for a finish cut inside but once there have been getting a great finish. Comments On Apr 23, 2015:Blade lasts a LONG time. Have literally created hundreds of pieces with the first blade the tool came with. Extremely versatile and easy to use. Perfect for beginners and more advanced turners. Comments On Apr 02, 2015:I love using these, already own several Easy Wood tools and wanted a hollower. Wasn't a hard choice to pick this one, like the way it feels while hollowing. Use it almost every day, having two lathes will be ordering an other soon. Roger is always there to help and delivery is on time. 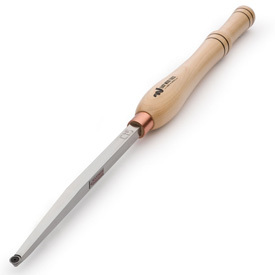 Comments On Sep 08, 2014:I love this tool great for hollowing and small coves. Comments On Oct 29, 2013:I'm very satisfied with the Easy Hollower No. 1. The tool is easy to use. It leaves a smooth interior without ridges. Comments On Oct 17, 2013:Beats any gouge or scraper hands down. Turning got a lot more fun!